​​​Sunny days and starlit evenings spent playing, splashing, and exploring can leave kids with more than warm summertime memories. Balmy weather also can lead to itchy, irritated skin. Check out the list from the American Academy of Pediatrics (AAP) to see how you can help prevent, identify, and soothe these common summertime skin rashes. Heat rash (also known as prickly heat or miliaria) is seen most often in babies and young children when sweat gland pores become blocked and perspiration can’t escape. The rash looks like patches of small pink or red bumps or blisters under clothing or spots where skin tends to fold—on the neck, elbows, armpits, or thighs—although heat rash can occur on other covered areas. Keep kids cool. Dress your child in clothing that keeps the skin cool and dry. If possible, use fans and air conditioning to avoid overheating. Pay attention to hot spots. Wash areas of the skin that stay wet with sweat, urine, or drool with cool water. Pat them dry. Keep skin bare. Leave areas open to air without clothing. Do not apply skin ointments. Many children get a burning, intensely itchy rash where their skin touches plants—such as poison ivy, poison oak, sumac—containing a sticky oil called urushiol. An allergic skin reaction causes redness, swelling and blisters. Other plants—such as wild parsnip, giant hogweed, and citrus—contain chemicals that make skin hypersensitive to sunlight and cause a phytophotodermatitis rash. Prevent exposure. Teach your child what these plants look like and how to avoid them. Both poison ivy and poison oak have shiny green leaves that grow three to a stem, so you might share the rhyme: “Leaves of three, let them be.” The sumac shrub has stems that contain 7-13 leaves arranged in pairs, while wild parsnip and giant hogweed have clusters of small, flat-topped yellow and white flowers. 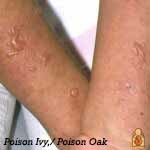 If you have younger children, inspect the parks they play in and have rash-causing plants removed. Wash and trim. If your child comes into contact with these plants, wash all of his or her clothes and shoes in soap and water. Also, wash the area of the skin that was exposed with soap and water for at least 10 minutes after the plant or the oil is touched. To discourage scratching and further damage to the skin, keep your child’s fingernails trimmed. This will also prevent the rash from spreading if there is still a small amount of oil under the fingernails. Soothing salves. If the rash is mild, apply calamine lotion to cut down on the itching. Avoid ointments containing anesthetics or antihistamines—they can cause allergic reactions themselves. Another good option to reduce skin inflammation is 1% hydrocortisone cream. Talk with your pediatrician. 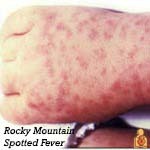 While mild cases can be treated at home, talk with your pediatrician if your child is especially uncomfortable, the rash is severe and/or isn’t going away, if the rash is on your child’s face or groin area, or if you notice signs of infection (i.e., fever, redness, swelling beyond the poison ivy or oak lesions). 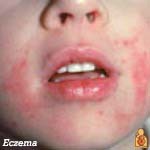 Eczema (also called atopic dermatitis or AD) is a chronic condition common in children that causes patches of dry, scaly red skin and tends to flare up during colder months when there’s less moisture in the air. But dryness caused by air conditioning and pressurized planes during summer travel can cause problems, too. Overheating, sweating and chlorine in swimming pools also can trigger eczema. Moisturize. Apply fragrance-free creams or ointments at least once a day or more often if needed. After a bath or swimming, gently pat your child’s skin with a towel and then apply moisturizer to his or her damp skin. Dress wisely. Choose clothing made of soft, breathable fabrics like cotton when possible. Wash clothes in a detergent free of irritants such as perfumes and dyes. Don’t scratch. Keep your child’s fingernails short and smooth, and remind him or her not to scratch. Scratching can make the rash worse and lead to infection. Talk with your pediatrician. Ask your child’s pediatrician if allergies, sometimes triggered by trees and plants that bloom during summer, could be a cause of the eczema. Your child’s pediatrician may recommend medicines to help your child feel better and to keep the symptoms of eczema under control. Insects such as bees, wasps, mosquitos, fire ants, and ticks can cause itching and minor discomfort where they prick the skin. For some children, insect bites and stings can cause a severe allergic reaction called anaphylaxis—which includes a rash or hivesand life-threatening symptoms such as airway swelling. (For children with a known allergy to insect bites and stings, it is important to have anaphylaxis emergency care plan in place). Other times, diseases spread by insects such as Lyme Disease, Rocky Mountain Spotted Fever, and Zika Virus can cause rashes and other health problems. Avoidance. When spending time outdoors, avoid scented soaps and shampoos and brightly colored clothing—they can attract insects. If possible, steer clear of areas where insects nest and gather (i.e., stagnant pools of water, uncovered food, and blooming flowers). Use insect repellent. Products with DEET can be used on the skin, but look for family-friendly products that contain concentrations of no more than 30% DEET. Wash the insect repellent off with soap and water when your child returns indoors. Cover up. When in wooded areas or in or near tall grass, stay on cleared trails as much as possible. Have your child wear a long-sleeved shirt, pants, and hat. Avoid wearing sandals in an area where ticks may live. Look closely. Wear light-colored clothing to make it easier to spot ticks. After coming indoors, check for ticks on your child’s skin—they often hide behind the ears or along the hairline. Remove stingers and ticks. To remove a visible stinger from skin, gently scrape it off horizontally with a credit card or your fingernail. If you find a tick, gently grasp it with fine-tipped tweezers as close to the skin as possible. Without squeezing the tick’s body, slowly pull it away from the skin. See How To Remove A Tick for more information. Clean the skin. After the stinger or tick is out, clean the bitten area with rubbing alcohol or other first aid ointment. Treat swelling. Apply a cold compress or an ice pack to any swelling for at least 10 minutes. Help relieve the itch. Applying ice, along with calamine lotion or 1% hydrocortisone cream, can also help relieve itching. Impetigo is a bacterial skin infection that’s more common during hot, humid weather. 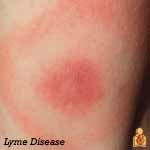 It causes a rash that may have fluid-filled blisters or an oozing rash covered by crusted yellow scabs. Impetigo is more likely to develop where there is a break in the skin, like around insect bites. Clean and cover. Clean the infected area with soap and water. Cover the infected area loosely to help prevent contact that would spread the infection to others or to other parts of the body. Wash your own hands well after treating your child’s sores. Avoid scratching. Trim your child’s fingernails and discourage scratching. A child can spread the infection to other parts of his or her body by scratching. You can cover the rash loosely with a bandage to discourage your child from touching the rash, but make sure air can flow through so the skin can heal. Talk with your pediatrician. While mild cases may respond to over-the-counter antibiotics such as bacitracin or bacitracin-polymyxin, impetigo is usually treated with prescription antibiotics—either a skin cream or oral medication. Your pediatrician may order a skin culture (test of your child’s skin) to determine which bacteria are causing the rash. Swimmer’s itch (also called clam digger’s itch or cercarial dermatitis) may appear after playing in lakes, oceans, and other bodies of water. The rash is caused by microscopic parasites found in shallow, warmer water near the shoreline where children tend to stay. The parasites burrow into skin, and cause tiny reddish, raised spots on skin not covered by the swimsuit to appear. Welts and blisters may also form. Be aware. Don’t swim near or wade in marshy areas where snails are commonly found. Try not to attract birds (by feeding them, for example) where your family swims. Birds may eat the snails and spread the parasites in the water. Shower or towel dry. Shower or briskly rub the skin with a towel immediately after getting out of the water. The parasites start to burrow when the water on skin begins evaporating. If your skin child’s skin stings with rubbing—and the rash appears under the swimsuit—he or she may instead have Seabather’s Eruptionfrom stinging larvae of sea critters such as jellyfish or sea anemone. Stop rubbing and shower instead. Don’t scratch. Trim your child’s fingernails and discourage scratching. Home treatments such cool compresses on the affected areas, Epsom salt or oatmeal baths, or baking soda paste may help to relieve the discomfort. If itching is severe, talk with your child’s pediatrician. He or she may suggest prescription-strength lotions or creams to reduce your child’s symptoms. Sandworms may be present in sand contaminated with feces from pets or stray animals. 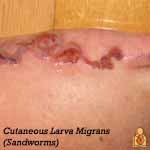 When a child stands or sits in contaminated sand on a beach or in a sandbox, the worms may burrow under the skin, usually around the feet or buttocks. Lines of itchy, reddish rash known as a creeping eruption appear as the worms move under the skin, up to a few centimeters a day. The condition is more common subtropical and tropical areas such as the Caribbean, as well as parts of the southwestern United States. Keep shoes on. Don’t let your child play on beaches where people walk their dogs. If your family goes on an outing to a designated pet-friendly beach, make sure your child keeps shoes on and doesn’t sit in the sand without a blanket or towel. Talk with your pediatrician. Your pediatrician can prescribe anti-parasitic medications such as albendazole or ivermectin to treat the rash. Without treatment, the larvae usually will die off in 5 to 6 weeks. Your pediatrician may suggest a cream to help relieve itching. 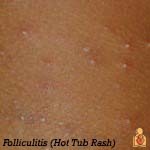 Folliculitis (hot tub rash) is an itchy, pimply rash that occurs when bacteria in unclean pools and hot tubs gets into hair follicles on the skin. The area where hairs grow from the skin becomes infected and inflamed, sometimes forming small, pus-filled blisters. A similar rash may come from wearing a damp swimsuit that wasn’t washed and dried well after previous use. Hot rub rash typically starts 12-48 hours after being in a hot tub. Avoid dirty pools. If you’re unsure whether the acid and chlorine levels are properly controlled in a heated pool, don’t allow your child to go in. Don’t allow young children in spas or hot tubs. In addition to the risk for drowning and overheating, young children are also at higher risk of bacterial skin infection because they tend to spend more time in the water than teens or adults. Talk with your pediatrician. 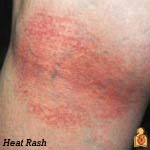 Hot tub rash usually clears up without medical treatment. In the meantime, warm compresses and an over-the-counter anti-itch cream recommended by your pediatrician can help your child be more comfortable. If your child’s rash lasts more than a few days, talk with your pediatrician. Molluscum contagiosum is a viral infection that causes pearly bumps on the skin on a child’s chest, back, arms or legs. The dome-shaped bumps, also known as “water warts,” may have a dimple in the center. The poxvirus that causes the bumps is more common in hot, humid climates. Some studies suggest the infection may spread in contaminated swimming pools. Wait it out. In most cases, molluscum contagiosum does not need treatment. The bumps usually will go away in 6 to 12 months. Stop the spread. A child with molluscum contagiosum should not share towels, bedding, or clothing with others to avoid spreading the virus. The bumps are contagious as long as they are present. Avoid scratching. Scratching the bumps can spread the virus and cause a second, bacterial infection where the skin is open. A smooth, reddened rash on your child’s feet, sometimes with peeling, cracking skin or scaly skin, could be from a condition called Juvenile Plantar Dermatosis (Sweaty Sock Syndrome). It happens when feet get wet and then dry quickly, again and again—like when shoes are taken on and off coming in and out of the house during summer. Breathable footwear. Reduce how often the feet go from wet to dry quickly by having your child wear open or more breathable footwear made of materials like mesh or cotton (i.e., water shoes) and/or thicker more absorbent socks. Apply ointment. Applying moisturizing ointment or an over-the-counter steroid cream to the affected areas of your child’s foot immediately after taking shoes off or getting out of water can help. If the condition does not improve, or if you notice any sign of infection where your child’s skin is cracking, talk to your pediatrician. Despite having “worm” in its misleading name, tinea (ringworm) is an infection caused by a fungus that thrives in warm, damp conditions. It is similar to athlete’s foot and jock itch and can appear on a child’s scalp or other parts of the body. It’s called ringworm because the rash from the infection tends to form round or oval spots that become smooth in the center as they grow while the border remains red and scaly. The fungus can spread quickly among student athletes, especially during sweaty, summertime practices and games, when they share sports equipment and locker rooms. Stop the spread. Check and treat any pets that may have the fungus—look for scaling, itchy, hairless areas on their fur. Family members, playmates, or schoolmates who show symptoms also should be treated. Do not allow your child to share combs, brushes, hair clips, barrettes, or hats. Make sure mats used in sports like wrestling and gymnastics are properly disinfected after use. Talk with your pediatrician. A single ringworm patch on the body can be treated with an over-the-counter cream recommended by your pediatrician. If there are any patches on the scalp or more than one on the body, or if the rash is getting worse while being treated, your pediatrician may prescribe a stronger medication and special shampoo. Symptoms are the worst in the first few days, but they are usually gone within a week. Peeling skin on the fingers, toes, and nails may begin after a week or two, but it is harmless. Parents of children with a history of atopic dermatitis or eczema should be aware that their children may be prone to a more severe outbreak. Monitor symptoms. Be sure to call your pediatrician if your child’s fever lasts more than 3 days or if he or she is not drinking fluids. If symptoms are severe, your pediatrician may collect samples from your child’s throat for lab testing. Ease the pain. For fever and pain, the pediatrician may also recommend acetaminophen or ibuprofen. Liquid mouth-soothing remedies may be useful to alleviate mouth ulcer pain. Do not use regular mouthwashes, because they sting. Avoid dehydration: Children with hand, foot, and mouth disease need to drink plenty of fluids. Call your pediatrician or go to the ER if you suspect your child is dehydrated. See Signs of Dehydration in Infants & Children for more information. Inform others. Tell child care providers and playmates’ parents to watch for symptoms of the illness. 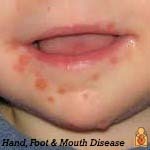 Children with hand, foot, and mouth disease may spread the virus through the respiratory tract (nose, mouth and lungs) for 1-3 weeks, and in the stool for weeks to months after the infection starts. Once a child’s fever has gone away and he or she is feeling better, there is no need to keep him or her home unless there are still open and oozing blisters. See When to Keep Your Child Home from Child Care for more information. Protecting your child’s skin is a year-round concern, but it’s especially important in the summer months when so much skin is exposed and vulnerable. Fortunately, many summertime rashes clear up quickly on their own. Be sure to talk with your pediatrician about any rash that you’re unsure about—especially if you don’t know what caused it, if it is making your child feel miserable or doesn’t clear up quickly, or if it shows signs of infection or is accompanied by any shortness of breath.